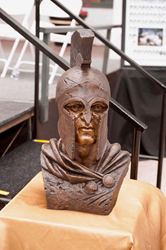 The Army and Navy Academy located out of Carlsbad, California, joins forces with Big Statues LLC of Utah to create an extremely life-like bronze bust of their mascot, the Spartan Warrior. All funding and efforts to bring this project to life were completed under the radar to provide a much anticipated graduation surprise to the school. We were hopeful they could bring our image and thoughts to life in a very powerful way. Big Statues did not disappoint! The Army and Navy Academy is over 100 years old and has many traditions. "It is difficult to find something “new” to start that is meaningful," stated Amy Coe, Assistant Dean of Academics at the Academy. "This year’s senior class of 2017 decided that they wanted a physical manifestation of our mascot; a Warrior. When we asked Big Statues to create a custom sculpture of our Warrior from a flat image, we were hopeful they could bring our image and thoughts to life in a very powerful way. Big Statues did not disappoint!" The Warrior is incredibly detailed and Matt Glenn and his team at Big Statues were careful to craft an image that conveyed the serious nature of the warrior while still attempting to capture the youthful enthusiasm and ferocity that are appropriate as a high school mascot. 'The definition of a Warrior is one who stands with unwavering honor, dedication, and bravery for his cause. This Warrior is a gift from the Class Of 2017 to represent all that we are and all that we hope to become. For more information on the Spartan Warrior Bust and to contact Big Statues LLC for further inquires concerning custom bronze statues, click here.